George W. Bush and the Making of an American President"
He Really Commit Suicide By Overdosing On Prescription Drugs? The troubled author of a biography accusing President Bush of hiding a three-decade-old cocaine arrest committed suicide Wednesday. James Howard Hatfield, 43, was found in a hotel room in Springdale, Ark., and appeared to have died from a overdose of prescription drugs, police said. 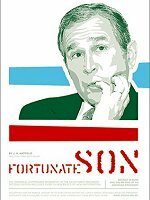 Hatfield wrote "Fortunate Son: George W. Bush and the Making of an American President" in 1999. The book cited unnamed sources in claiming that Bush was arrested in 1972 but that his case was expunged. Bush, who was campaigning for president when the book was published, denied the allegations. Soon after "Fortunate Son" was released by St. Martin's Press, the company discovered that Hatfield had been convicted in 1988 of attempted murder of his former supervisor. It recalled 70,000 copies in October 1999 and left an additional 20,000 books in storage. Police went to Hatfield's house Tuesday morning to arrest him on charges of credit card fraud, but Hatfield wasn't home, said Detective John Hubbard of the Bentonville, Ark., Police Department. His body was found around noon Wednesday by a hotel housekeeper. Hatfield left notes for his family and friends that listed alcohol, financial problems and "Fortunate Son" as reasons for killing himself, police said. He is survived by a wife and daughter. After the book had been dropped by St. Martin's, it was picked up a month and a half later by Soft Skull Press, a small publisher on New York's Lower East Side. Sander Hicks, the head of Soft Skull, said yesterday that he joins the family "in feeling this deep loss." "He did have a past that he was working very hard to put behind him," Hicks said. In "Fortunate Son," Hatfield said three unnamed sources claimed a judge had expunged Bush's case and given him community service as a favor to his father, who was ambassador to the United Nations at the time. The incident raised questions of how well publishers screen the credentials of authors and check facts in their books. Hatfield was convicted in 1988 of paying a hit man $5,000 to murder his former boss with a car bomb. Both passengers in the vehicle, the intended victim and a colleague, escaped unharmed when the bomb malfunctioned. After news of that conviction surfaced, it was also discovered that Hatfield had pleaded guilty to embezzlement in 1992. Was James Hatfield's Death a Suicide or Murder? Was the death of James Howard Hatfield, author of "Fortunate Son,"
a suicide or a murder? Dear Friends and Members of the Press,We have been reeling from the news since Friday. Jim Hatfield is gone. In a country where not enough reporters and talking heads have the courage to speak truth to power, Hatfield, the President's most controversial biographer, ended his own life in solitude in an Arkansas motel last week. I knew Jim. He could be tempestuous, moody and unpredictable. He was also intensely driven, articulate and full of Southern charm. When I spoke with his widow Nancy on Friday, we agreed, "He was a good writer." He was a hell of a fighter and you wanted him on your side. Just last month we spent a weekend together in Chicago on the trade show floor of Book Expo America. He signed books, shook hands, worked the crowd, spoke out, strategized with me and revealed sources. We went non-stop together to promote his Bush biography Fortunate Son. He was fond of quoting Langston Hughes, "I've been insulted, eliminated, locked in, locked out, and left holding the bag. But I am still here." two-year long media carnival, and the character assassination of Jim Hatfield, an ex convict turned author who had paid his debt to society. Jim Hatfield's death is in part on the hands of an imperious American media establishment that reserves the softest touch money can buy for George W. Bush and all sons of privilege. Jim Hatfield, a working class journalist unannointed by the media elite, was viciously made into an example. He had a fearlessness that will be missed. He was fond of quoting Langston Hughes, "I've been insulted, eliminated, locked in, locked out, and left holding the bag. But I am still here." These statements seem to be in conflict. He prided himself on his ability to survive. Until that ability was exhausted. I don't know for certain, but the evidence does seem to indicate suicide.